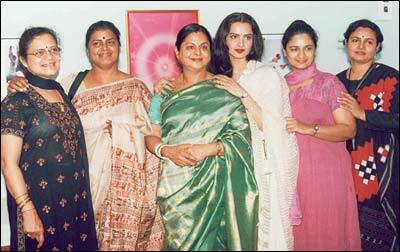 Rare sight: Rekha and her five sisters! To see six of Gemini Ganesan's seven daughters together is a rare sight. In December 2004, when he was very ill, they�made it a point to come down to Chennai and nurse their father. They met again in�February 2005,�at Chennai's Apollo Hospital. Rekha was to inaugurate the Apollo Wellness Clinic, and all the sisters except Rekha's own sister, Radha, made it a point to attend the function. The eldest among the six sisters�is Dr Revathi Swaminathan, a radiation oncologist practising in Illinois, USA. Dr Kamala Selvaraj, Gemini Ganesan's second daughter, runs the G G Hospital in Chennai. Narayani Ganesan is�a journalist with The Times Of India in Delhi. The youngest is Dr Jaya Shreedhar, a�health advisor with Inter News Network. Rekha and Radha are Gemini Ganesan's daughters from actress Pushpavalli, and Vijaya Chamundeswari, daughter of actress Savithri, is a fitness expert working at the G G Hospital. "The only one missing is Rekha's sister Radha who is in the US," says Dr Jaya Shreedhar. "She is elder to both Viji [Vijaya] and me. "Though Appa was unwell, we had some good moments when we met in December. People may assume that there are strained relationships because we don't share the same mother but there is nothing like that," she adds. "We�are professional women, and over the years, have�learnt to appreciate each sister for what she is. We did not have the pleasure of growing up together. In fact, between my own elder sister Revathi and me, there is a 20 year age difference. Appa was very happy to have all of us together. This was a kind of pleasure he never had when we were young." Jaya was the only�daughter who saw her father at home when she was young. "By the time I was born, he was a senior star and had moved out of those relationships, and was with my mother. It is really strange but the upbringing was in a way that there was never any ill-will. You are born into it," she says. "Suppose we were brought up in a middle class, rigid culture, I might have found it unusual and emotionally challenging. When we sisters met this time, it was more like six 'wild' cousins meeting and talking non-stop. It was lots of fun!" From left to right: Dr Revathi Swaminathan,�Narayani Ganesan, Dr Kamala Selvaraj, Rekha, Vijaya Chamundeswari and�Dr Jaya Shreedhar. Ms. Rekha is the brightest and glittering among all the six but others also looking good.